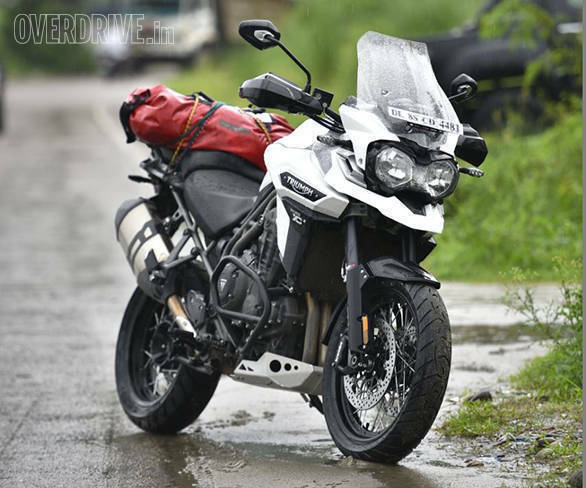 It wouldn't be wrong to say that 1,200cc adventure tourers like this brand new Triumph Tiger Explorer are the equivalent of litre-class superbikes. They are the most tech-laden, largest capacity motorcycles in their segment and more often than not, are the pinnacle of the respective brand's prowess in making bikes that can truly go anywhere. Triumph's new generation Tiger Explorer is the latest such flagship adventure tourer to get launched in the country, priced at Rs 18.75 lakh ex-showroom, and we've just spent a few hours in its saddle. Should the likes of the BMW R 1200 GS and the Ducati Multistrada be worried, then? 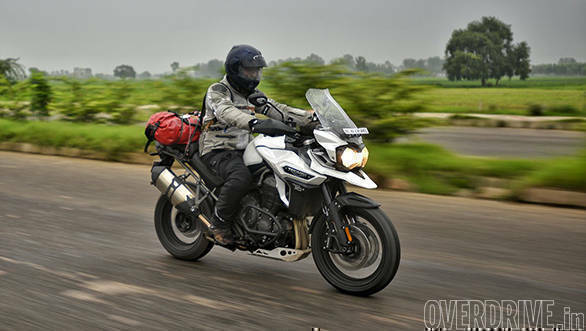 The new Triumph Tiger Explorer isn't a mere facelift, even if the face, particularly the headlights look similar to the older bike. 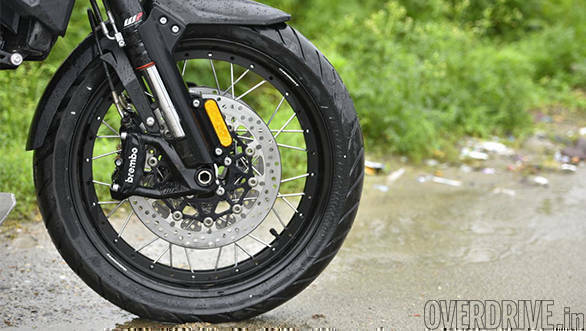 One of the biggest highlights on the new bike is the introduction of semi-active suspension. This brings it in line with one of its arch rivals, the Ducati Multistrada 1200 S. The updated 1,215cc inline triple cylinder engine also gets ride-by-wire. Power and torque outputs stand at 137PS, produced at 9,300rpm and 121Nm at 6,400rpm. The bike gets a host of electronics as well, and Triumph has only launched the XCx variant (out of six total) of the bike in India. It gets riding modes including Road, Rain and Off-road apart from cornering ABS and traction control. On the design front the bike looks more appealing thanks to the sharper lines of the fuel tank and 'beak' and the revised design of the screen. The screen is now electrically controlled and you can move it up or down at the mere touch of a button. 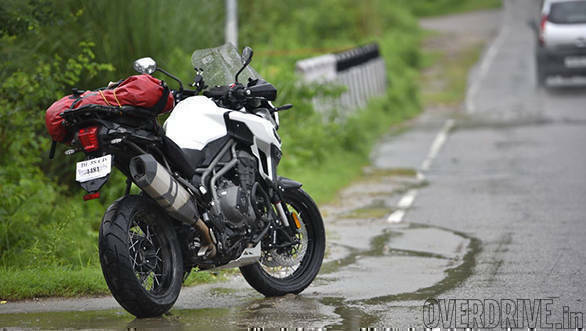 The design of the Tiger Explorer's rear end is similar to the older bike and the spoked wheels, especially the rear, with the shaft drive and single-sided swing arm look eye-catching. 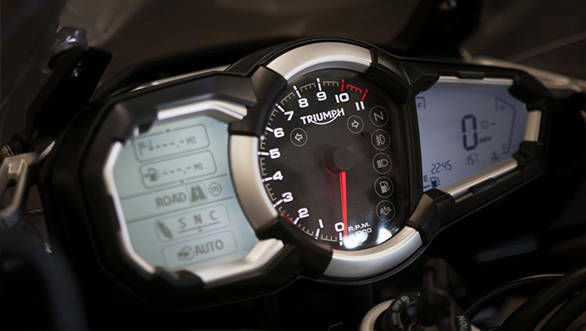 Clocks look different from the older bike and the tachometer sits in the centre, flanked by monochrome displays on either side. The left display tells you about riding modes, suspension setup, ride time, efficiency and the like, while the display on the right integrates the speedometer, gear indicator and fuel and temperature gauges. Given all the techno-gadgetry on the bike, we would have liked an all-digital, colour display though. We rode the bike from New Delhi to Chandigarh across NH1, which is pristine tarmac almost all the way. So our current experience right now is limited to mile munching on open, smooth highways which helped us understand the new bike's demeanour as a tourer. Triumph though says the bike is a highly capable off-road tool. But that is a story for another day. The updated inline triple sounds and feels sporty from the word go, more like a street or sportsbike, particularly because of the exhaust note which is unlike most other adventure tourers. The engine offers healthy bottom end grunt and the bike feels very quick when taking off from standstill. Acceleration is strong until about 6,500rpm after which its begins to taper off, but just by a bit. The bike barely breaks into a sweat getting to triple digit speeds, and sustaining well over 100kmph all day long is no big deal for the motor, which also feels supremely refined. It's a good feeling to ride the wave of torque without having to put the six speed gearbox to much use too. Being a full sized adventure tourer the Explorer is a big motorcycle, but you get used to the size in just a few minutes. The riding position is such that you sit slightly canted forward and the footrests aren't too rear set either which makes it easy to stand on the pegs while riding. That said, three cylinders sitting in line mean your legs are spread slightly wider than twin cylinder engined adventure tourers. With a seat height of 837mm, the Explorer's saddle is pretty tall, and this isn't a motorcycle shorter riders will be able to straddle with ease. Also, if you're under six feet tall, putting both feet down fully when sitting on the bike is a problem. The electrically operated screen works rather well - a mere flick of a switch moves it up or down. You could look at it as a gimmick, but this will a boon if you're switching from fast riding on open highways to slower speeds in the city as you won't need to even take your eyes off the road to move the screen, let alone having to pull over and adjust it manually. Accessing menu options on the left side of the handlebar is a fairly easy and riding modes can be changed in a jiffy and so can the setup of the semi active suspension. The bike is happy eating miles and can cover distances rapidly without letting you realise the speeds you are doing thanks to the refinement of the engine and the wind protection. Switching lanes at speeds feels a bit heavy on effort. This is partly because of the 19-inch front wheel. The big front wheel, an off-road essential, also robs you of some feel from the front-end on tarmac. The larger wheel should certainly help matters off tarmac though. The semi active suspension does an excellent job of soaking in bumps, undulations, expansion joints and pretty much everything on the road irrespective of speeds and makes for good comfort. On the flip side, it causes the bike to wallow a bit when riding over undulated surfaces when going fast. The long, 1,520mm wheelbase offers stability at triple digit speeds but even at its stiffest setting the suspension felt slightly softer than I would have liked. 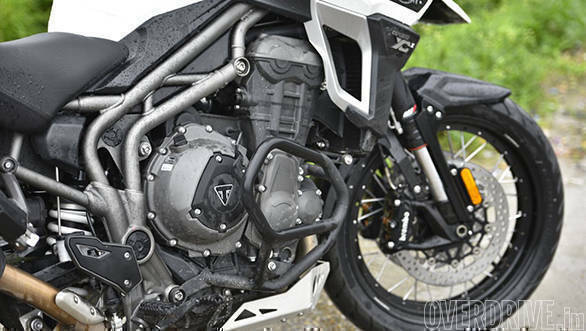 Some more stiffness would have helped make the bike more agile in making quick directional changes too, as the Explorer is a heavy motorcycle with its 253kg dry weight. Which means you are looking at a kerb weight of nearly 280kg, given the tank capacity of 20 litres. 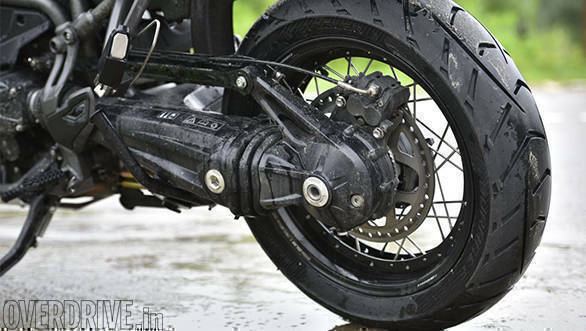 With its long travel the suspension also causes the bike to pitch forward slightly when braking hard from high speeds and unweighting the rear, which clearly hints at the fact that the softer setup is more off-road biased. Our 240km ride from the national capital to Chandigarh was a breeze given the accessible performance from the Tiger Explorer's engine. The ride was comfortable thanks to the pliant suspension though it came at the expense of absolute confidence when trying to sustain high speeds on open stretches. The Triumph Tiger Explorer is priced at ?18.75 lakh ex-showroom. It brings a lot of new equipment, sharper styling and the off-road cred of the Tiger to the table. 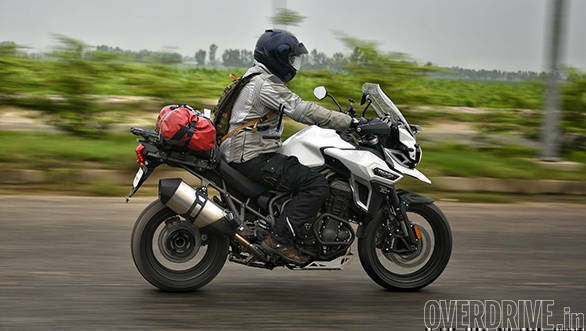 But it enters a space that both popular and well populated, from the slightly smaller but much cheaper ?13.06 lakh Honda Africa Twin DCT to the Ducati Multistrada which impressed us during its road test and is priced approximately ?1.5 lakh cheaper than the new Tiger Explorer. 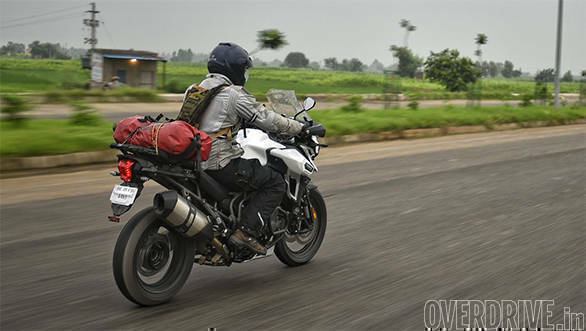 Watch out for further stories on the Triumph Tiger Explorer on OVERDRIVE as we continue to ride it.